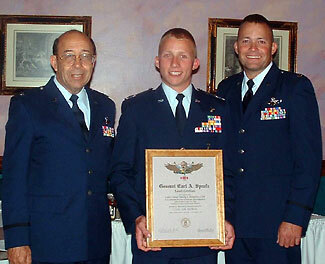 C/Col Timothy J. Humphries was presented Spaatz Award #1478 at the 2003 Tucson Composite Squadron 105 semi annual banquet. His award was presented by his grandfather, Colonel James F. Humphries Jr. USAF (Ret.) and his father, Lieutenant Colonel Thomas D. Humphries USAF. Col Humphries was on staff at the U.S. Air Force Test Pilot School and flew 101 combat missions in Vietnam in B-57Gs. Lt Col Humphries is currently an HH-60G Special Operations/Combat Rescue helicopter instructor pilot at Kirtland AFB, New Mexico. C/Col Humphries is a graduate of Cadet Officer School, Basic and Advanced National GSAR School, National Blue Beret, and Advanced Hawk Mountain Ranger School. He also participated in IACE Norway. He is currently on a 4-year Air Force ROTC scholarship at the University of Arizona.